As Hollywood continues to plunder (and re-plunder) every property with the teensiest bit of name recognition, the prospect of a remake of Paul Verhoeven’s RoboCop was no doubt horrifying to many. Surprisingly however, this new version, whilst not perfect, is quite a worthwhile exercise. I presumably made very few friends in announcing that I quite liked the Total Recall remake. However, it’s important to realise that I never really liked the Schwartzenegger-starring original. When it comes to 1987’s Robocop though, I’ve always been a fan. Verhoeven’s whole ‘European filmmaker beating Hollywood at its own game’ schtick really came through there, and the movie’s gleeful excesses made it a classic. The new RoboCop is a different kind of film, however. It’s still a satire with the USA squarely in its sights, but this one seems a much more realistic, contemporary exploration of the collusion between corrupt institutions. It’s not quite ‘The Wire’ – though does feature Michael K. Williams – but it’s an intelligent analysis of how the modern world works. 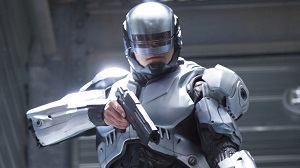 More importantly, however, this RoboCop really focusses on the horror of Alex Murphy’s situation. As a cop in the near future who is left for dead, he is remade as the cutting edge crime-fighter by the conflicted Dr Dennett Norton (Gary Oldman). Oldman’s in fine form here, effectively playing a version of Dr Frankenstein, simultaneously thrilled at his successes and horrified at the consequences. Kinnaman is a wise casting choice, though isn’t perfect. He doesn’t really have the typical leading man charisma (much like Peter Weller, I guess) but is perfect once he dons the suit, portraying a man trying to fight his robotic programming. Fans of the original may have been aghast when they learned that this film wouldn’t get an R rating, but rest assured that there is one scene in particular that is truly nightmarish. RoboCop explores the notion of what it means to be a cyborg with an astounding degree of depth and complexity, especially for a mainstream movie. In fact, it’s a much better science fiction film than it is action film. If you put down money hoping for some nifty violence and cool explosions, then you’ll be sorely disappointed with RoboCop. The action is thin on the ground and, when the film does get violent, it’s not particularly impressive. The fight scenes are dull and often hard to follow. I was fantastically pleased with RoboCop’s exploration of the issues surrounding its sci-fi premise, and whilst I was rarely sucked in emotionally, as a philosophical ‘what if?’ kind of movie, it’s genuinely absorbing. Your enjoyment of the film will depend on what you’re after when you sit down to watch it. Sci-fi geeks ought to get a kick out of it (unless they’re still not over the concept that someone’s remaking a beloved film of the 80s) whilst those simply looking for some mindless action will find themselves disappointed. This entry was posted in Film Reviews and tagged Action/Adventure, Satire, Science Fiction by Stuart Wilson. Bookmark the permalink.